Rip currents can be found on many surf beaches everyday. Under most tide and sea conditions the speeds are relatively slow. However, under certain wave, tide, and beach profile conditions the speeds can quickly increase to become dangerous to anyone entering the surf. 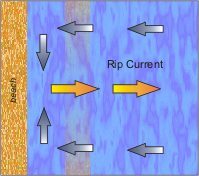 The strength and speed of a rip current will likely increase as wave height and wave period increase. They are most likely to be dangerous during high surf conditions as the wave height and wave period increase. 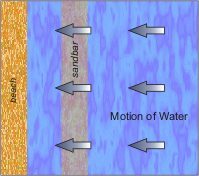 a channel of churning, choppy water an area having a notable difference in water color a line of foam, seaweed, or debris moving steadily seaward and a break in the incoming wave pattern. None, one, or more of the above clues may indicate the presence of rip currents. Rip currents are often not readily or easily identifiable to the average beachgoer. For your safety, be aware of this major surf zone hazard. Polarized sunglasses make it easier to see the rip current clues provided above. If you are unable to swim out of the rip current, float or calmly tread water. When out of the current, swim towards shore.